Throughout the first months of 1915 a vast area of the moorland landscape near Clipstone was gradually changing as hundreds of wooden huts were erected. These were to accommodate soldiers of Kitcheners New Army who would live and train in the area for weeks, or even months, before moving on to participate in the Great War. 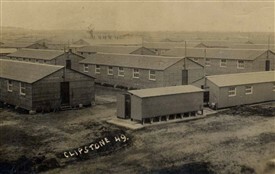 This huge hutted complex was known as Clipstone Camp. They arrived at Edwinstowe on the 12th May 1915 and had to march four miles in the rain and were ankle deep in mud. The camp that greeted them was still in the process of being built. Candles were the only means of illumination as electricity to the camp had not yet been supplied. One soldier wrote home "we have no lights, knives, forks or looking glass." More and more troops gradually arrived and additional to their military training some found themselves helping to prepare parade grounds etc., at the camp. 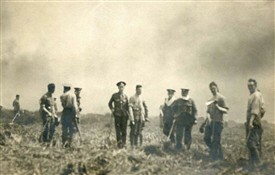 Others found they were needed to help put out fires when the heather caught fire on land adjacent to the camp. The newspapers also revealed the lack of huts to accommodate all the soldiers. The Notts Evening Post 10 July - 'The Khakie stream continues to flow to Clipstone, several more battalions have arrived during the week. 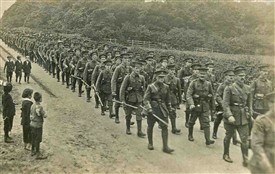 On Wednesday over 1,000 men of the ASC [Army Service Corps] came along and have gone under canvas. Some of them are quartered close to Sherwood Hall, others have passed to the new camp at Rufford and the remainder have a triangular piece of land at the entrance to the Dukes Drive at Clipstone'. 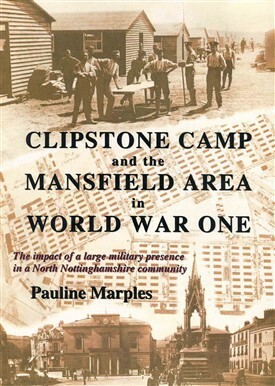 With upwards of 30,000 soldiers at Clipstone Camp at any one time the total number of soldiers who were there during those years is unknown What is known is the impact it had on the people and communities of Mansfield and area. Much of this can be discovered in the book 'Clipstone Camp and the Mansfield Area in World War One' (details from heritage.foresttown@ntlworld.com or see the Books for Sale page on this web site). Soldiers both training and marching were a regular sight for miles around. One hundred years on  the land which was once covered with hundreds of wooden army huts is now virtually a mass of housing estates, schools and other local amenities. Visually there is nothing to tell you it was once one of the biggest military training camps, and demob camp in the country Only the very enthusiastic historians can still discover artefacts that the soldiers have left behind, (see the examples), or the remnants of trenches that soldiers dug and trained in. However interest in Clipstone Camp is growing as more people like myself continue to do research. New information is being discovered all the time from various sources, and as more records are digitised and put on the internet. The centenary of the start of the Great War in 2014 encouraged a new awareness and enthusiasm of local and military history. Students at Garibaldi College (built on the site of Clipstone Camp) have for the past months been working on an exhibition 'Lest We Forget' which is on display in Mansfield Museum throughout May 2015. 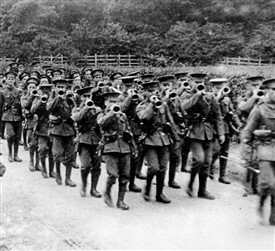 Sherwood Pine Forest, near Clipstone, has an ongoing project relating to Clipstone Camp and the First World War Trenches. 'WW1 Clipstone Camp' can be found on Face Book where people can add information/comments. The www.ournottinghamshire.org.uk and www.ourmansfieldandarea.org.uk web sites both have pages relating to Clipstone Camp with facilities to add comments and expand the knowledge about the camp and the people who were there. As 2015 progresses it is anticipated information on these web site will continue to grow - keep visiting and 'watch this space'. This page was added by Pauline Marples on 11/05/2015. 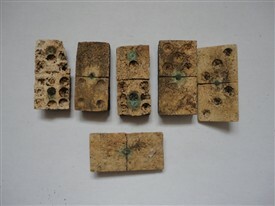 Surely those clay pipes - and perhaps the dominoes too? - are from an earlier period than the Great War. Cigarettes must have entirely replaced such pipes by 1914. It would be interesting to know if those items were found near a pub, or the site of some kind of hostelry. Hi Ralph clay pipes were used through out WW1 (as were bakelite type too. Some people don't realise bakelite was invented in 1907 and in use at that time). The clay pipe industry virtually died out after WW1 although some pipes were used into the 1930s. There is no pub or establishment marked on any of the prewar maps so I think they were discarded or lost during the camps existence. 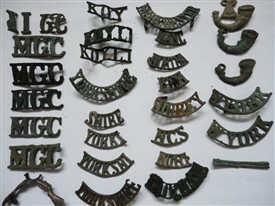 The items shown in my article above are just a small selection of the many that were discovered on the Clipstone Camp site which was previously heathland. Clipstone Camp which was ultimately for the training of soldiers in WW1 also had numerous establishments offering shops and recreation facilities, and dominoes was a popular past time. Additionally soldiers in the Clipstone Military Hospital would benefit from such a therapeutic occupation. While cigarettes were popular during WW1 smoking pipes had certainly not been discarded as can be seen on many military photographs. Clay pipes were still being purchased -see www.rowntreesociety.org.uk - First World War Rowntrees and Workers, the section 'Collection for Wounded Soldiers' reveals a purchase of 144 clay pipes. Netley Hospital, Hampshire in WW1 also had a shop that sold clay pipes. Indeed in 1955 clay pipes were still in popular demand as revealed on britishpathe.com. A short film shows a husband and wife team, who were making 1,000 clay pipes a week. My grandfather .joined up in 1915 aged 17, we think in london. he lived in Ringmer in Sussex.he was in the 33 division which was part of kicheners new army. eventually this division became part of the fifth army. in july 1915 according to the 33 division history written in 1920 the division came to clipstone camp for initial training he survived the war but was blown up by a shell and shell shocked in 1918. he became a lewis gunner in 1917. He described to me 30 years ago how he fired into densely packed attacking germans killing great numbers. this action is confirmed in the 33 division history.